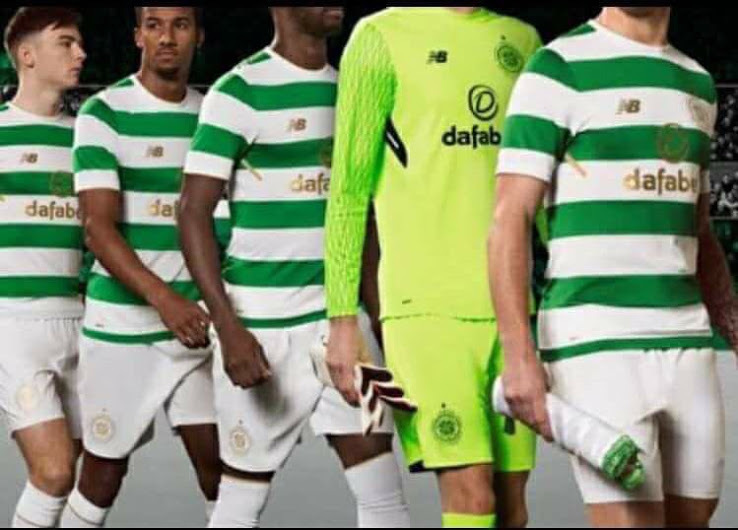 We're right in the thick of 'leaked jersey season' and it seems fitting that on the day Brendan Rodgers' men thrashed Rangers 5-1 at Ibrox, the new Celtic jersey for next season has been revealed. New Balance did a solid job with the current home jersey, but as well as Liverpool's 125 year anniversary jersey they are planning another throwback tribute for Celtic. It's 50 years since the Lisbon Lions won the European Cup by defeating Inter Milan 2-1 in 1967, and the club had confirmed that next season's jersey would be a nod to that great side. The jersey will be officially unveiled next week on May 4th, but as they tend to do, the detectives at Footyheadlines.com managed to get their hands on some leaked images in advance. The quality isn't fantastic on that first image, but this one featuring Scott Brown gives a better idea of how it will look. First impressions are good, it's a very simplistic jersey with a round collar that will surely be popular with the fans, but we can't help but feel that once again the sponsor detracts from the overall look. Particularly on an anniversary jersey, the gaudy gold branding takes the focus away somewhat. Celtic fans, what do you make of the new jersey? Get in touch and let us know.